THE TRUTH ABOUT RWANDA by Christopher Black As far back as December 1993, UN reports document the massive build-up of men and weapons coming into Rwanda from Uganda. The UN force that was deployed supposedly to ensure a peaceful transition, in fact, was a cover for the U.S. and its allies to assist in this build-up. General Roméo Dallaire, the Canadian general in charge of the UN force, hid this build-up from the Rwandan army and the President. The build-up was accompanied by death threats against President Habyarimana. In October 1993, according to an account of Habyarimana’s last conversation with Zairian president Mobutu just two days before the Rwandan president was murdered, U.S. State Dept. representative Herman Cohen told President Habyarimana that unless he ceded all power to the RPF, they would kill him and drag his body through the streets. He received the same threat from the Belgians and the Canadians through General Dallaire. These threats were punctuated by the murder of the Hutu president of Burundi by Tutsi officers in October 1993, another assassination in which Kagame and the RPF had a hand. In the aftermath of that murder, 250,000 Hutus were massacred by the Tutsi army of Burundi, and hundreds of thousands of Hutus fled to Rwanda. ........The RPF was directly assisted in this offensive by the U.S., which set up the UN Rwanda Emergency Office in Nairobi, manning it with U.S. Army officers and acting as the operational headquarters of the RPF to give them intelligence on Rwandan Army troop movements, actions and directions. Prudence Bushnell, Deputy Assistant Secretary of State for African Affairs under Ambassador George Moose, telephoned the Rwandan Army chief of staff in May 1994 and told him that, unless he surrendered, he must know that he would be fighting the United States of America and would be defeated. U.S. Special Forces fought along side the RPF. There is also evidence of the Belgian UN forces involvement from an intercepted radio message sent by Kagame to his forces in the field and referring to the help the RPF had received from the Belgians. The Dallaire Genocide Fax by Christopher Black As UN documents show, Dallaire was aware, at least from December 1993, and probably before, that the RPF, with the support of the Ugandan Army, was daily violating the Accords by sending into Rwanda men, materiel, and light and heavy weapons in preparation for a final offensive. Dallaire kept this information from his boss Booh-Booh and the Secretary General, Boutros-Ghali. The RPF was assisted in these violations of the Accords by the Belgian contingent of UNAMIR and the Canadian officers involved who turned a blind eye to the RPF and Ugandan Army smuggling into Rwanda men and materiel and even assisted them in doing so all the while protesting that the Hutu regime was hiding weapons, a charge which has never been proved. ......All these circumstances can lead to one conclusion only; that the fax is a fabrication after the fact and that a fraud is being committed on the people of Rwanda and the world and the judges of the Rwanda war crimes tribunal. This fabricated fax is being used to try to condemn the accused on trial before the ICTR and to support the now discredited idea that a genocide was planned by the former Rwandan government against the Tutsi population of that tragic country. However it is becoming increasingly clear that General Dallaire worked with the RPF throughout the period of his mandate in Rwanda in violation of the UN mandate. Booh-Booh states that he provided military intelligence to the RPF as well as covering up their preparation for their final offensive and through his false testimony at the Rwanda War Crimes Tribunal and his book continues to act on behalf of powerful interests in his own government and that of the United States and Britain. The fabrication of the “genocide” fax is one more nail in the coffin of the Rwanda war crimes tribunal, ready to be buried under the weight of accusations of selective prosecution, political bias, unfair procedures, trial by hearsay, perjured testimony and the cover-up of the murder of two African heads of state and all in the name of a new colonialism masquerading as “international justice”. Who Killed Agathe? The Death of a Prime Minister by Christopher Black It was the Canadian, General Romeo Dallaire, Force Commander of UNAMIR, who arranged for one axis of the runway at the airport to be closed at the request of the RPF, making it easier to shoot down the plane as it tried to land. 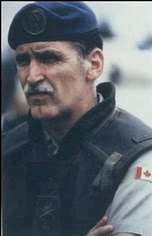 Dallaire also consistently sided with the RPF during his mandate, gave continuous military intelligence to the RPF about government army positions, took his orders from the American and Belgian ambassadors and another Canadian general, Maurice Baril, in the Dept of Peace-Keeping Operations in New York, lied to his boss, Jacques Roger Booh-Booh, about his knowledge of a build-up for a final Ugandan Army-RPF offensive(7), and turned a blind eye to the infiltration into Kigali of at least 10 battalions and possibly 13,000 RPF combatants when they were permitted only 600 under the Arusha Accords. ......She may have thought she was safe at the UNDP compound. But New York and Dallaire were alerted to her presence and for several hours did nothing to ensure her safety. Why did General Dallaire and Colonel Marchal do nothing to protect the prime minister, the most important political figure in Rwanda, though they easily protected the prime minister designate, and her controller, Faustin Twagiramungu? Just like men, dead women tell no tales. Agathe cannot tell us who killed her. Her children, still alive, are silent. There are many disturbing questions to be asked of General Dallaire, Colonel Marchal, Faustin Twagiramungu, Paul Kagame and others regarding the death of the prime minister. It is time an international investigation was conducted into the affair to learn the answers, something the prosecutor at the ICTR singularly refuses to do.